Rack, Stack, and Organize with Patton's Model 1001MP16 Multi-Functional Universal Mounting Panel. Rack up to 16 Patton MicroPak Devices into a dense 2U solution. The Model 1001MP16 Universal Mounting Panel offers the ability to rack-mount any of Patton's MicroPak products side-by-side. Products that are compatible with the 1001MP16 include Device servers, Media converters, Ethernet bridges, Fiber modems, Interface converters, and many more! The sturdy 2U design of the 1001MP16 enables quick and hassle-free installation into any standard 19-inch rack. 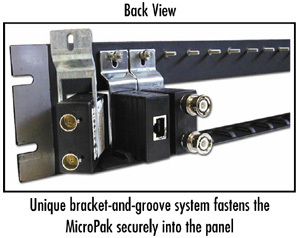 The 1001MP16's unique bracket-and-groove mounting system enables Patton MicroPak cases to be mounted securely into the panel. Dry-erase labels and individually numbered ports are provided for easy circuit/port identification. The Model 1001MP16 provides an economical method for converting your favorite Patton standalone MicroPak products into a customized rack-mounted solution.